A bit of a lie in and then the wonderful sight of sun pouring in the window over the river as we opened the bedroom door. Two smiling faces met us for breakfast and over breakfast chats a plan for the day was identified. First though the maps were brought out and we were able to look at our itinerary which had not been defined after the Great Ocean Road and then the Melbourne stop. It was really useful to discuss options and routes. We finally agreed on how we would approach it, maps were put and we set off on a voyage of discovery of the local area. Both Ross and Jenny were a veritable fount of information about comings and goings, properties and businesses bought and sold, enterprises entered into with great hope and then ending in the the for sale sign going up. Wellington comprises of a number of properties and the Wellington Hotel clustered around the ferry that crosses the river. In a previous life it had a Courthouse and goal when it had been one of the main routes across the area. Sadly for Wellington the bridge and later railway line was awarded to a neighbouring town further up the river and Wellington lost its status as a major staging post. Now a ferry carries any traffic that takes the Wellington Road and it is an area for water based holidays – boating, fishing and the outdoor life are obvious attractions. Wine is a major local industry and very good it is too. 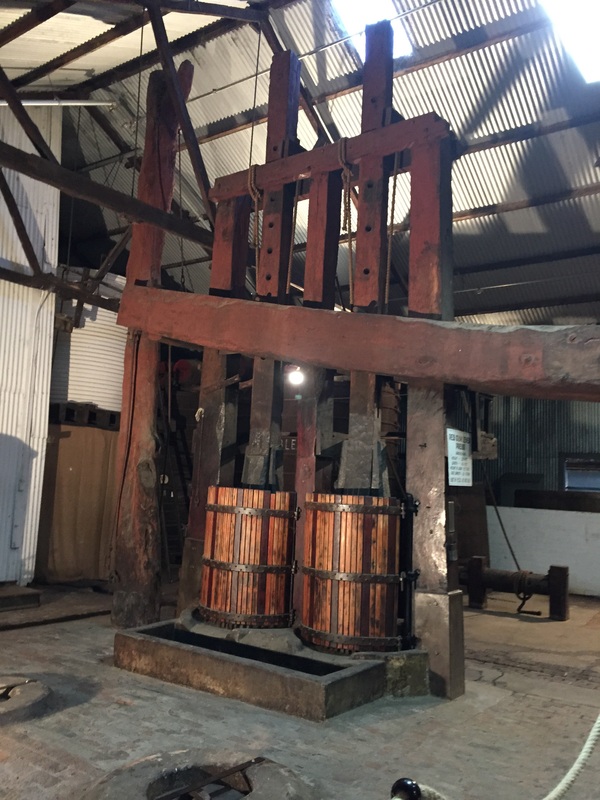 We stopped off at the Bleasdale vineyard ostensibly to sea the old wooden grape press made of red gum. It was very impressive and made by a very enterprising gentleman named Mr Potts who over his life span lived 14 years on Kangaroo Island, built paddle boats and created a wine empire! In addition he had over the years two marriages and a number of children. A busy chap! The wine press was surrounded by old hand made barrels still used for making wine, port and sherry. It seemed rude not to take up the offer of a tasting and we were particularly impressed with their Pinot Gris unusual for a mainly red wine area. Managing to escape without a purchase, we continued on through the vineyards and then up and away to a landscape more akin to the Lake District, complete with old dry stone walls. It was glorious. We had an early lunch in a bistro in a little town called Strathalbyn. Ross had a hospital appointment that we had to get him to for an eye issue. It was a very nice lunch and exceptionally reasonable in terms of price. The town has a large park area and is on an ox bow formed by the river Angas. (Thank you Miss Springate for this insight all those years ago!). The original settlers arrived in 1839 identifying it as a good grazing area and established the town, building first the inn and then the church. Businesses grew up around and about and it began to really thrive during the gold rush of the 1850’s when it became the last town before Mount Alexandra in Victoria. Lunch over, we travelled across to Mount Barker to the hospital and dropped Ross off and picked him up an hour later. 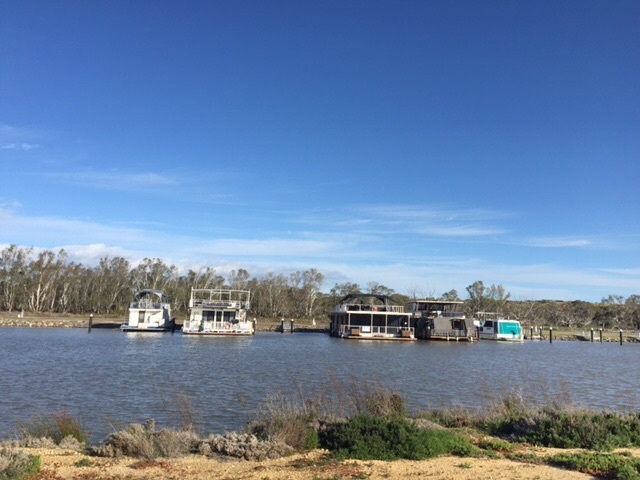 Then, Jenny driving, we took off for the Murray River again and were fascinated by the large houseboats moored to the river bank. They were enormous!! They were also building holiday homes on stilts along the riverside. These were very exotic – with space for boats and car parking. The area was disastrously flooded in 1950. The bridge, so long awaited in Wellington, was eventually built across at this point and later a rail bridge joined it and the fate of Wellington was assured. 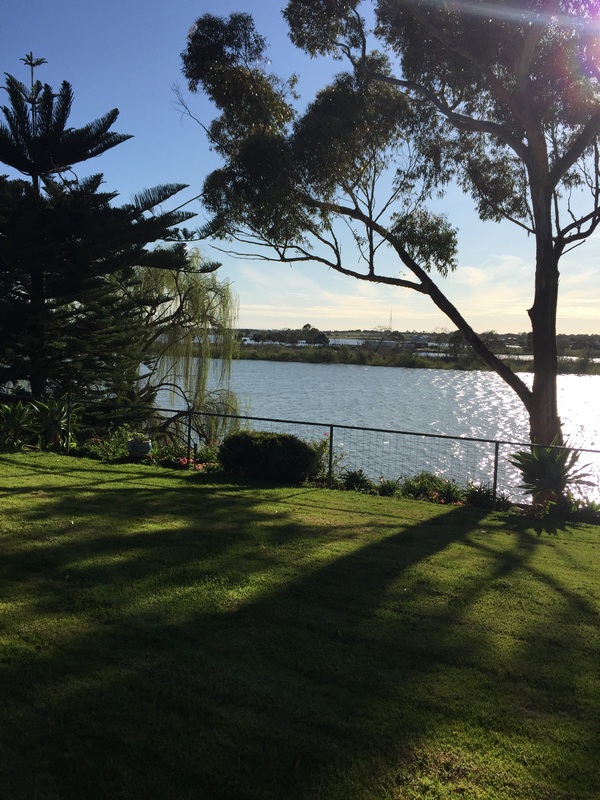 After a wonderful tour of the vicinity, it was back to the Hacienda del Wightman for more ruminating, bird watching (they have a whistling kite nesting in the tree outside – much to Keith’s delight!) and Jenny’s cooking which was lovely, although we managed to resist the lovely pavlova which had been our downfall in terms of calorie intake the night before! Ross needed to retire early to recover from the hospital procedure and Keith and I weren’t far behind as the morrow marks the start of the long drive to Melbourne. “Whistling kite”; there must be a joke there somewhere. What tune? Please say you got a photo.